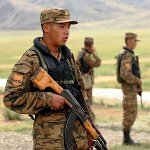 After 10 days of International Women's Day Mongolia celebrates Men's and Soldier's Day. March 18 is a holiday of Mongolian men and also the anniversary of military establishment in Mongolia. Previously this holiday was devoted to the Mongolian soldiers only, but eventually it became men's holiday. The date for the holiday was chosen as the day when the Mongolian People's Army was established in 1921. The Army was established as the secondary army under Soviet Red Army command and aided by it in securing the Mongolian Peoples' Republic in its territory. The Mongolian men are congratulated on this day, they receive presents and eat their favorite dishes. Different competitions on military theme are held among men, for instance, schools can organize marching competitions among students. Other unusual competitions can be organized on national level among men of different professions, like the best short advertisement and newspaper articles about soldiers among professional journalists.